Sharing Wheels donated 137 kids’ bikes for low income families to Christmas House in 2018. Every bike got some TLC first – cleaning, new tires, safe brakes, etc. We need volunteers each fall to refurbish bikes for the kids! No experience is needed, just a willingness to get greasy. Kids old enough to help are welcome provided they are supervised by a responsible adult. You or your organization are welcome to contribute to the cause. We can put $10 to $20 in new parts on a bike to make it safe and shiny for the kids. That adds up to about $1,500 in tires, seats, handlebar grips, etc. We also pay for snacks and incentives to keep our volunteers happy. We couldn’t afford the Christmas House bike program without volunteer and community support. Thanks to Raising Cane Ranch and the Pate Family for supporting our kids bike programs. The Gyro Shack in Everett is providing lunch for a volunteer work party. Sno-Isle Food Co-Op has provided healthy juice and snacks at our fall work parties. A grant from B.I.K.E.S. Club of Snohomish County pays for the parts that make the bikes like new. 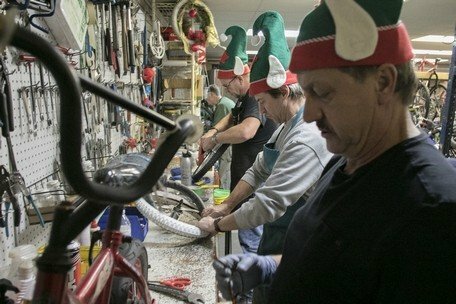 Volunteers donate about 350 hours of labor into fixing bikes each year.